A mother's warning after her luxury car locked her children in. A mother's dire warning after her luxury car deadlocked her children inside. "If you have a car with similar feature, please be very careful." A mother-of-three has posted a frightening warning to other parents who drive cars with keyless entry when her luxury car deadlocked itself on a hot summer’s day with her three children – one just 12 weeks old locked inside. Despite numerous attempts to unlock it from the inside by her brave five-year-old, the car would not unlock stranding her children inside the dangerously hot vehicle. The still shaken mum says the terrifying experience has left her so shocked she still can’t talk about it without crying. The incident comes just weeks after a group of consumers in the US filed a class action claiming the feature of hands-free and remote locking and unlocking of car doors in some BMWs is defective, causing vehicles to “spontaneously lock” while keys and sometimes drivers’ children are inside the car. 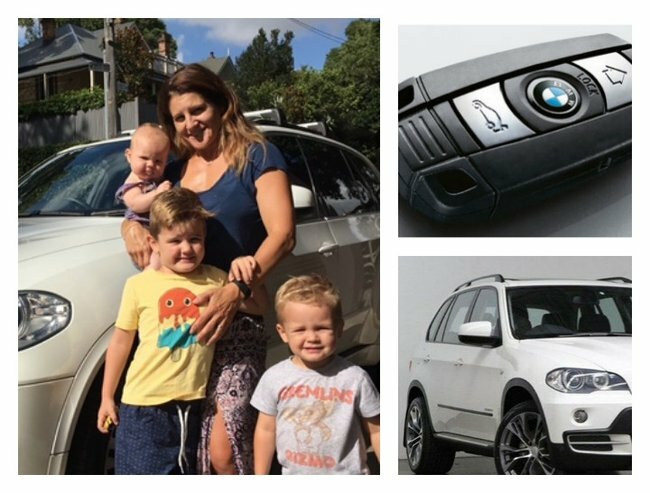 Haidee Keegan from Sydney says that a month ago, on a hot Sydney day she put her three kids, aged five, two and just three-months-old in their BMW X5. She says she put her baby, Scout in her car sear and placed her car key next to the baby capsule. Haidee says she always placed the key on the seat while she strapped her baby in. Haidee told The Motherish that she has no idea how the car became locked inside, she says she has a feature called "comfort access" which means you don&apos;t need to be holding the key to open and start the car, the key just needs to be nearby, or in the car. The vehicle had deadlocked itself. Panicked Haidee instructed her son, Jett, 5, to unbuckle his seat belt and go and press the central locking button on the dash. She says it did nothing. Haidee alerted the NRMA and Triple-0 while a passing friend tried to smash the window with a rock, but that too didn’t work, the rock simply crumbling to dust. Haidee Keegan says that when the police finally arrived after around 25 minutes they smashed open her car window, but even then they too couldn’t unlock the doors and her children had to be passed out through the window after a rescuer crawled through the smashed window and handed the scared children to their relieved mother. She wrote on Facebook that her children were okay. Haidee says “the car shouldn&apos;t be able to lock with the keys inside." Haidee says that she can’t understand what happened and that BMW have failed to give her an acceptable answer to why the car locked. "But, I struggle to understand how you could deadlock a car with the door open." Since Haidee posted her warning to other parents on Facebook she says she has been flooded with stories of similar situations - some with there very same model of car, and in fact in the US BMW is facing a lawsuit with a proposed class action in a California federal court claiming its feature of hands-free and remote locking and unlocking of car doors is defective, causing vehicles to “spontaneously lock” while keys and sometimes drivers’ children are inside the car. Kieva Myers of San Francisco said in a complaint filed in January that all 2008 through 2015 X5 vehicles manufactured and sold by BMW contain a potentially defective automated feature. Myers alleges her BMW deadlocked “very young child” and keys inside her car last October. In the report customer service said they found no issues with her keys. The report said they identified no issues except a low key battery voltage which they corrected by putting in a new battery. The Motherish sought comment from BMW, but they have not yet responded. For Haidee the terrifying event has made a lasting impact, one she hopes other parents never have to experience. “I still can&apos;t talk about it without getting upset. I have tears now! I think about what if&apos;s all the time. I think about it every time I approach my car with the kids with me. I look at my kids and I feel so blessed that they are here with me." “Warning - my car deadlocked itself with kids inside on a hot day.